Even on a stiflingly hot summer's day, the Athens underground is a pleasure. It is air-conditioned, with plasma screens to entertain passengers relaxing in cool, cavernous departure halls - and the trains even run on time. There is another bonus for users of this state-of-the-art rapid transport system: it is, in effect, free for the five million people of the Greek capital. With no barriers to prevent free entry or exit to this impressive tube network, the good citizens of Athens are instead asked to 'validate' their tickets at honesty machines before boarding. Few bother. This is not surprising: fiddling on a Herculean scale — from the owner of the smallest shop to the most powerful figures in business and politics — has become as much a part of Greek life as ouzo and olives. Indeed, as well as not paying for their metro tickets, the people of Greece barely paid a penny of the underground’s £1.5 billion cost — a ‘sweetener’ from Brussels (and, therefore, the UK taxpayer) to help the country put on an impressive 2004 Olympics free of the city’s notorious traffic jams. The transport perks are not confined to the customers. Incredibly, the average salary on Greece’s railways is £60,000, which includes cleaners and track workers - treble the earnings of the average private sector employee here. The over ground rail network is as big a racket as the EU-funded underground. While its annual income is only £80 million from ticket sales, the wage bill is more than £500m a year — prompting one Greek politician to famously remark that it would be cheaper to put all the commuters into private taxis. Significantly, since entering Europe as part of an ill-fated dream by politicians of creating a European super-state, the wage bill of the Greek public sector has doubled in a decade. At the same time, perks and fiddles reminiscent of Britain in the union-controlled 1970s have flourished. Ridiculously, Greek pastry chefs, radio announcers, hairdressers and masseurs in steam baths are among more than 600 professions allowed to retire at 50 (with a state pension of 95 per cent of their last working year’s earnings) — on account of the ‘arduous and perilous’ nature of their work. This week, it was reported that every family in Britain could face a £14,000 bill to pay for Greece’s self-inflicted financial crisis. Such fears were denied yesterday after Brussels voted a massive new £100bn rescue package which, it insisted, would not need a contribution from Britain. Even if this is true — and many British MPs have their doubts — we will still have to stump up £1billion to the bailout through the International Monetary Fund. 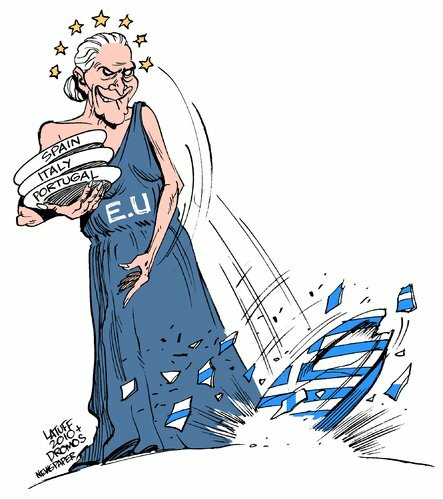 In return for this loan, European leaders want the Greeks’ free-spending ways to end immediately if the country is to be prevented from ‘infecting’ the world’s financial system. Naturally, the Greek people are not happy about this. In Constitution Square this week, opposite the parliament, I witnessed thousands gathering to campaign against government cuts designed to save the country from bankruptcy. After running battles with riot police, who used tear gas to disperse protesters, thousands are still camped out in the square ahead of a vote by Greek politicians next week on whether to accept Europe-imposed austerity measures. Yet these protesters should direct their anger closer to home — to those Greeks who have for many years done their damndest to deny their country the dues they owe it. Take a short trip on the metro to the city’s cooler northern suburbs, and you will find an enclave of staggering opulence. Here, in the suburb of Kifissia, amid clean, tree-lined streets full of designer boutiques and car showrooms selling luxury marques such as Porsche and Ferrari, live some of the richest men and women in the world. With its streets paved with marble, and dotted with charming parks and cafes, this suburb is home to shipping tycoons such as Spiros Latsis, a billionaire and friend of Prince Charles, as well as countless other wealthy industrialists and politicians. One of the reasons they are so rich is that rather than paying millions in tax to the Greek state, as they rightfully should, many of these residents are living entirely tax-free. Along street after street of opulent mansions and villas, surrounded by high walls and with their own pools, most of the millionaires living here are, officially, virtually paupers. How so? Simple: they are allowed to state their own earnings for tax purposes, figures which are rarely challenged. And rich Greeks take full advantage. Astonishingly, only 5,000 people in a country of 12 million admit to earning more than £90,000 a year — a salary that would not be enough to buy a garden shed in Kifissia. Yet studies have shown that more than 60,000 Greek homes each have investments worth more than £1m, let alone unknown quantities in overseas banks, prompting one economist to describe Greece as a ‘poor country full of rich people’. Manipulating a corrupt tax system, many of the residents simply say that they earn below the basic tax threshold of around £10,000 a year, even though they own boats, second homes on Greek islands and properties overseas. Even more incredibly, Greek shipping magnates — the king of kings among the wealthy of Kifissia — are automatically exempt from tax, supposedly on account of the great benefits they bring the country. Yet the shipyards are empty; once employing 15,000, they now have less than 500 to service the once-mighty Greek shipping lines which, like the rest of the country, are in terminal decline. With Greek President George Papandreou calling for a crackdown on these tax dodgers — who are believed to cost the economy as much as £40bn a year — he is now resorting to bizarre means to identify the cheats. After issuing warnings last year, government officials say he is set to deploy helicopter snoopers, along with scrutiny of Google Earth satellite pictures, to show who has a swimming pool in the northern suburbs — an indicator, officials say, of the owner’s wealth. Officially, just over 300 Kifissia residents admitted to having a pool. The true figure is believed to be 20,000. There is even a boom in sales of tarpaulins to cover pools and make them invisible to the aerial tax inspectors. But faced with the threat of a crackdown, money is now pouring out of the country into overseas tax havens such as Liechtenstein, the Bahamas and Cyprus. ‘Other popular alternatives include setting up offshore companies in Cyprus or the British Virgin Islands, or the purchase of real estate abroad,’ says one doctor, who declares an income of less than £90,000 yet earns five times that amount. There has also been a boom in London property purchases by Athens-based Greeks in an attempt to hide their true worth from their domestic tax authorities. ‘These anti-tax evasion measures by the government force us to resort to even more detailed tax evasion ploys,’ admits Petros Iliopoulos, a civil engineer. Hotlines have been set up offering rewards for people who inform on tax dodgers. Last month, to show the government is serious, it named and shamed 68 high-earning doctors found guilty of tax evasion. Yet, already, it is too late. Greece is effectively bust — relying on EU cash from richer northern European countries, but this has been the case ever since the country finally joined the euro in 2001. Two years earlier, the country was barred from entering because it did not meet the financial criteria. No matter: the Greeks simply cooked the books. Two years later, having falsely claimed to have met standards relating to manufacturing and industrial production and low inflation, the Greeks were allowed in. 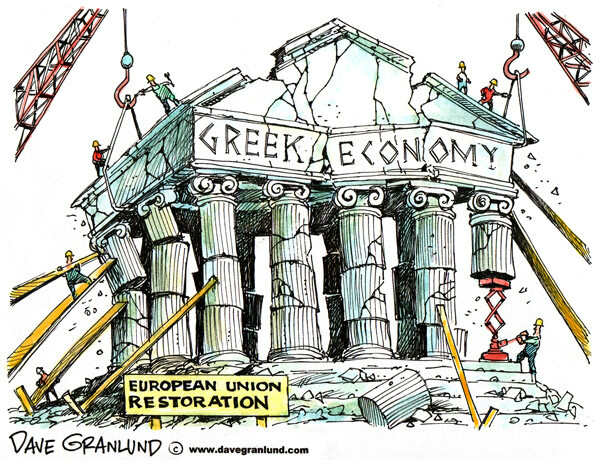 Funds poured into the country from across Europe and the Greeks started spending like there was no tomorrow. Although Brussels has now agreed to provide the next stage of its debt payment programme to safeguard the count ry’s immediate economic future, the Greek media still carries ominous warnings that the military may be forced to step in should the country’s foray into Europe end in ignominy, bankruptcy and rising violence. For now, the crisis has simply been delayed. With European taxpayers facing the prospect of saving Greece from bankruptcy for the second year in a row, some say even the £100bn on offer will pay off only the interest on the country’s debts — meaning it will be broke again within two years. 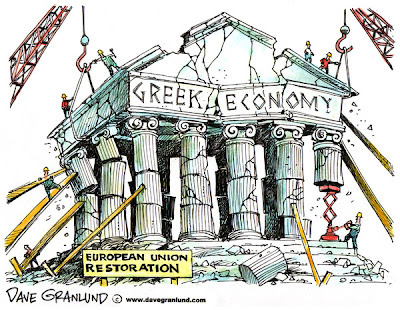 Meanwhile, there are doom-laden warnings that the collapse of the Greek economy could be the catalyst for another global recession. Perhaps if the Greeks themselves had shown more willingness to tighten their belts and pay taxes due to the state, voters across Europe might not now be feeling such anger towards them. But having strolled the streets of Kifissia, and watched the Greek hordes stream past the honesty boxes on the underground, it does not take a degree in European economics to know when somebody is taking advantage — at our expense.